A main focus of research in the Dalecki lab centers on investigating the mechanisms of interaction of ultrasound fields with biological tissues. Physical mechanisms for the production of bioeffects with ultrasound include heating, cavitation, and purely mechanical interactions of the sound field with the tissue, such as radiation force and acoustic streaming. In the Dalecki lab, efforts focus on identifying the molecular, cellular, and physical mechanisms for biological effects of ultrasound fields. Knowledge of basic mechanisms contributes to the safe and effective development of new diagnostic and therapeutic ultrasound techniques. This line of research has been funded by the National Institutes of Health (NIH), theNational Science Foundation (NSF), the U.S. Navy, and The Whitaker Foundation. 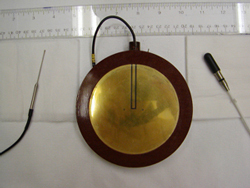 Hydrophones used to measure ultrasound fields.